Tulip brand Spa Lotion contains 70% organic botanicals including Aloe, Mandarin, Lavender and Verbena flowers. This anti-oxidant moisture rich lotion contains oils of Avocado, Jojoba, Olive and Grapeseed with anti-oxidant green tea and vitamins C and E. This lotion absorbs immediately, leaving your skin soft and supple. Spa Lotion is a paraben-free formula, not tested on animals. 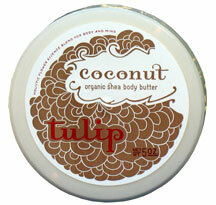 Tulip's Organic Shea Body Butter contains 80% certified organic ingredients. This rich whipped creamy moisturizer contains a 20% level of certified organic intense shea butter which is proven to protect and heal your skin. AGE-DEFYING properties of organic white tea and fruit acids, plus organic olive, jojoba and grapeseed oils will help keep skin silky and glowing. Organic Shea Body Butter is a paraben free formula and is not tested on animals. Tulip's Organic Hand and Body Wash is 70% Certified Organic. Pure and natural cleansers from moisturizing coconut and sugar are blended with certified organic aloe, lavender, verbena and orange. Oat and apple proteins make this cleanser very hydrating. Shea butter adds that extra dose of nourishment for soft skin, Great for bath and shower or at the sink for hands. Lather and enjoy! 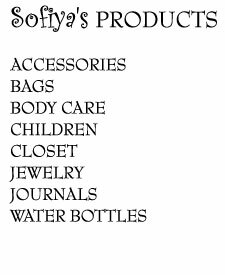 Organic Hand and body wash is a paraben free formula and is not tested on animals.